(Left) Lindy Mandradjieff leads a class at Dance Conservatory of Charleston; (right) a shot from her time with the New York City Ballet. In 2014, Lindy Mandradjieff’s husband, Matt Fabyanic, accepted a job that relocated their family of five from Pittsburgh to Charleston. Settling in here, Mandradjieff, a former ballet dancer with New York City Ballet and San Francisco Ballet—two of the country’s most illustrious companies—began considering her own next steps. She stumbled upon an empty building near her son’s West Ashley school, and in June 2017, her Dance Conservatory of Charleston debuted. “My mission is to build a place that offers elite training in an environment of warmth,” Mandradjieff says, noting that students range from 18-month-olds (in Mommy-and-Me classes) to high-school seniors and adults who drop in for open classes on Saturdays. Yet Mandradjieff has a bigger goal: to make Charleston a dance hub by bringing in master teachers, lining up auditions for summer programs and colleges, and partnering with the forthcoming Daniel Island Performing Arts Center to give students pro performing experience. 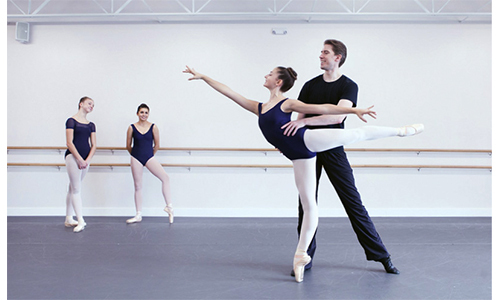 Columbia City Ballet’s Bo Busby is on the school’s faculty. Mandradjieff’s own professional dance life began when, at 15, she left home in Pittsburgh to attend the School of American Ballet (SAB) in New York City, one of the top training academies in the U.S. It’s this experience of leaving home as a teen that frames her studio’s mission to provide students the best opportunities possible—right here in Charleston. Traveling to other cities for master classes or auditions can be cost-prohibitive, so Mandradjieff uses her dance-world connections to draw pros here. In December, she welcomed legendary SAB teacher Suki Schorer to instruct her advanced students; they’ve also gotten to work with modern dancer/teacher Jason McDole and Broadway veteran Stephen Hanna. This winter, the studio hosts audition tours for several summer programs, as well as for Point Park University’s Conservatory of Performing Arts in Pittsburgh. Master classes and auditions, however, aren’t only for those dreaming of a professional career. “It’s crucial to build the next generation of artists, but also of art lovers—those who may one day become patrons or work in arts administration,” says Mandradjieff.